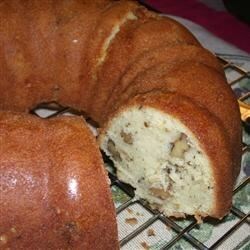 "This easy recipe makes a wonderfully moist pound cake with plenty of butter and pecans." Cream together butter and sugar. Add eggs one at a time beating after each one. Blend in the flour, vanilla extract, butter extract and pecans. Pour into a greased and floured bundt or tube pan. Bake in a preheated 325 degrees F (165 degrees C) oven for 1 to 1 1/2 hours or until a toothpick inserted comes out clean. Remove from oven and remove cake from pan right away, cool then sprinkle with confectioners' sugar. I have used this recipe many times and everyone loves it!!! Really easy and really good! Will cook again! this is a basic super easy recipe i used tonight when i had no baking powder,soda....i just added a TSp sourcream and extra vanilla...no nuts or butter extract. baked it in a long loaf pan. This was good but not what I had expected. Im not into "sweet cooking" the cake did not rise it was flat but it did have an ok flavor. I really like this recipe. my family enjoyed it too. This cake is a waste of pecans. The pecans were on top not in the cake and the cake was dense and tasted too much of eggs. Maybe some baking powder would help.